Singer-songwriter Brad Petersen has family ties in Country Music that run back three generations, and carry his love for country music forward. In 2018, Brad released his first E.P., titled "Second Chances" featuring Scott Joss and Doug Colosio, both alumni of Merle Haggard's group. The album has been a labor of love, a year in the making with so many great friends contributing their talents to this project. "Four musicians, lost in the Sierras, found ourselves with stringed instruments, plectrons, bows, and sound amplification. Our musical styles come together in a danceable variety, from western swing to eastern european and everything in between." 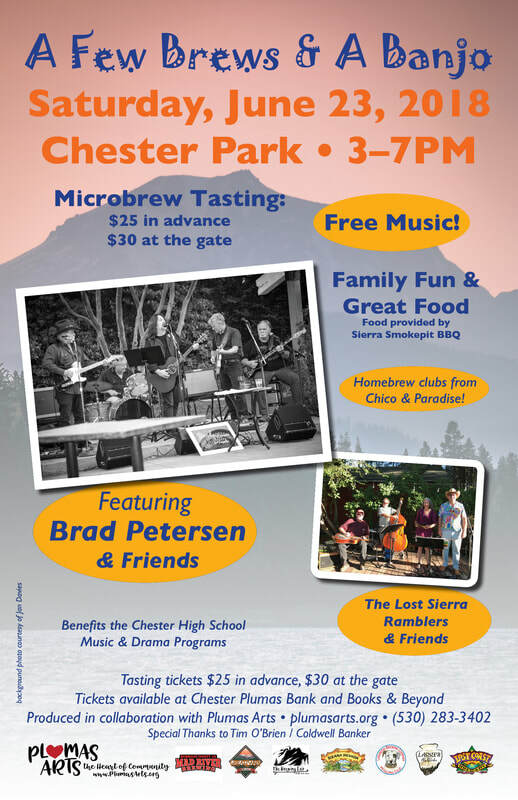 On June 23rd, 2018, Chester Park will once again be the location for A Few Brews & A Banjo— an event that has been helping to raise funds for area school arts programs since 2004. Music and beer samplings take place from 3pm to 7pm. There will also be nonalcoholic beverages and and Sierra Smokepit BBQ. $25 presale discount beer tasting tickets are available in Chester at Plumas Bank in Chester and Books & Beyond. At the gate the ticket price will be $30. Plumas Arts has been the event's sponsor for many years. The event is staffed by community volunteers who help with the set up, beer serving, clean-up and take down and all other aspects of the event. EDGEWATER playing at A Few Brews & A Banjo in 2013.